Gabby Street wanted revenge, so he went to the firm of Hallahan and Grimes. Street, in his second year as Cardinals manager, wanted to avenge his team’s loss to the A’s in the 1930 World Series, which Philadelphia won in six games. He had his chance as the day dawned on Game Seven of the 1931 Series, thanks to Wild Bill Hallahan, who won Games Two and Five, and Game Three winner Burleigh Grimes. It was only fitting that both pitchers were involved in the game that won it all. This series pitted two teams that boasted great staffs. Philadelphia led the American League with a 3.47 ERA, while the Cardinals ranked second in the National League with a mark of 3.45. The clubs had vastly different offensive styles. The Athletics had three sluggers who would reach the Hall of Fame. Jimmie Foxx’s 30 home runs represented half the total of the entire Cardinal team. Al Simmons had 22 and Mickey Cochrane launched 17. Cochrane’s total would have led the Cardinals. Future Hall of Famer Chick Hafey had 16 to lead St. Louis, while the only other Redbird to reach double figures was George Watkins, with 13. Conversely, St. Louis ran rings around the A’s. Their 114 stolen bases led the National League, while Philadelphia was last in the American League with 25. Street had legitimate cause for concern going into the for-all-the-marbles matchup, as the A’s had pounded his Cards, 8-1, in Game Six, and the Philadelphia starter for Game Seven, George Earnshaw (21-7, 3.67 ERA during the season), had pitched very well. He gave up only two earned runs on six hits in a 2-0 loss in Game Two; then threw a two-hit shutout in Game Four, which the A’s won, 3-0. Street put his team’s fate in Grimes’s damp hand. Grimes, one of baseball’s last (legal) spitballers, was 17-9 with a 3.65 ERA in one of the last seasons of his Hall of Fame career.2 He pitched brilliantly in his only other Series start, going into the eighth inning of Game Three with a no-hitter and winning 5-2. Grimes’s mastery over the A’s continued at the beginning of Game Seven, as he retired the first three Philadelphia hitters in order in the first. Third baseman Andy High led off for St. Louis in the bottom of the inning, and how he got to that spot is an interesting story. Sparky Adams was the Cardinals’ third baseman and leadoff hitter during the regular season, but on September 20 he sprained his ankle rounding first base during, of all things, a pregame skills competition between his team and the Brooklyn Dodgers. After High played Game One and Jake Flowers Game Two, Street inserted Adams into the lineup for Game Three, but his gimpy ankle forced him to leave after the fifth. Prior to Game Four, Flowers was injured during the pregame warm-up when a groundball jumped up and hit him in the face. He started the game – no one had heard of concussion protocols in 1931 – but left after the first due to dizzy spells. Adams started Game Five but departed after limping to first with a leadoff single off Waite Hoyt. High took over in both games. Flowers played Game Six, but his fifth-inning throwing error on a Jimmie Foxx grounder led to four unearned runs. Hence, High started Game Seven. He got to play on a beautiful, sunny day, too, with the temperature in the mid-70s. Oddly enough, Sportsman’s Park was only half full. After more than 39,000 watched the Cardinals lose Game Six, only 20,805 showed up for the clincher. They got their money’s worth. Ignoring the low turnout, the Cardinals wasted no time showing Earnshaw that Game Seven was not going to be like Game Four. Both High and number-two hitter George Watkins singled to start the Cardinals’ first, and moved up on a sacrifice by Frankie Frisch. Earnshaw uncorked a wild pitch, allowing High to score the game’s first run, while Watkins moved to third. The next batter was Street’s not-so-secret weapon, one Johnny Leonard Roosevelt “Pepper” Martin, who was in his first full season in the majors. Martin had already tied what was then the World Series record with 12 hits in the first five games, with one home run, five RBIs, and four stolen bases.3 He walked and promptly stole his fifth base of the Series. Ernie Orsatti was the next hitter, and he struck out, but Cochrane dropped the third strike and when he threw to first to get Orsatti, an alert Watkins darted for home. Foxx’s return throw to the plate was off the mark, and the Cardinals had a quick 2-0 lead. Jim Bottomley struck out to end the inning. Grimes breezed along with his two-run lead. He gave up two hits in the second but came out of the inning unscathed, and made up for walking Max Bishop in the third by picking him off first base. His teammates rewarded Grimes for that move in the bottom of the inning. High smacked his second straight single to lead off, and then Watkins launched his only round-tripper of the Series over the right-field pavilion. St. Louis led 4-0 going into the fourth. An early four-run lead didn’t mean much against a team with sluggers like Foxx and Simmons, and Earnshaw did his part by settling down and not allowing a baserunner through the next four innings. However, Grimes also continued pitching well. He had some trouble in the fifth when he gave up two hits, but a double play ended that threat. He was perfect in the sixth and struck out the side in the seventh, including Foxx and Simmons. Things got interesting in the eighth as Grimes, who was pitching despite being in great pain from appendicitis, began to tire. After Dib Williams struck out, Grimes walked Phil Todt, who was pinch-hitting for Earnshaw. Todt moved to second when Bishop grounded to third. Mule Haas got the second walk of the inning – only Grimes’s third of the game – but Cochrane lined out to Grimes for the third out. Many managers, no doubt, have cursed the person who thought that games shouldn’t end after the eighth inning. The Redbirds’ skipper was probably one of them, using blue language as Grimes started the ninth by walking Simmons. Pitching 101 says it’s never a good idea to walk the leadoff hitter, especially when the guy behind him, Foxx, had driven in 120 runs during the season. But Foxx didn’t come through this time, fouling out to catcher Jimmie Wilson. One away. The next batter, Bing Miller, had the Cardinals sniffing the $4,480-per-man World Series money when he grounded into a force play at second base. Two down. That’s when Grimes really got into trouble; he walked Jimmy Dykes and then Williams singled to load the bases. Up came Doc Cramer, living every kid’s dream – Game Seven, ninth inning, two out, bases loaded, with the chance to be a hero. Okay, so a two-run single isn’t how these fantasies usually play out, but Cramer’s hit did make the game closer and brought Grimes’s day to an end. Street brought Hallahan in to face Bishop, who flied out to, appropriately, Martin, and the celebration began. Faber, Charles. 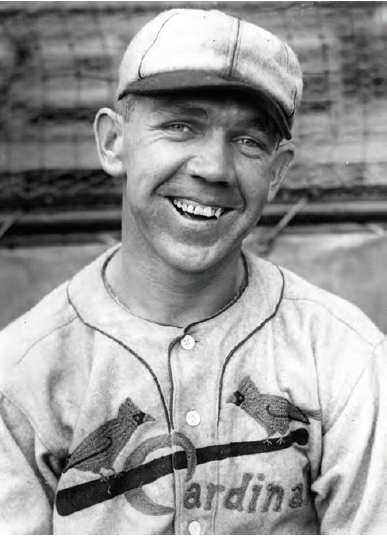 “Burleigh Grimes,” in The 1934 St. Louis Cardinals: The World Champion Gas House Gang (Phoenix: Society for American Baseball Research, 2014). 1 L.S. Cameron, “Cards Defeat Macks to Win World Series,” Pittsburgh Press, October 11, 1931: 1. 2 According to BaseballAlmanac.com, 17 pitchers were allowed to continue using the spitball after it was outlawed in 1920. Three other pitchers still threw the wet one in 1931: Red Faber, Clarence Mitchell, and Jack Quinn. Grimes was the last of the group, retiring after the 1934 season. 3 Three other players had 12 hits in a World Series before Martin: Buck Herzog for the New York Giants in 1912, Shoeless Joe Jackson for the Chicago White Sox in 1919, and Sam Rice for the Washington Senators in 1925. 4 “Noisy Celebration on Streets When Cards Win Series,” St. Louis Post-Dispatch, October 10, 1931: 1.